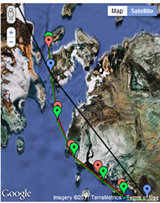 A 350 mile race on skis to The Magnetic North Pole pulling 100Ib pulks. Competing in the High Arctic – a hostile, unfamiliar and unforgiving environment. Arguably the toughest and most extreme endurance challenge on earth. The Polar Race, starts from Resolute Bay in Nunavut (the former North West Territories of Canada) and takes contestants 350 miles across the world’s most desolate terrain in -40C temperatures to the Magnetic North pole. Competitors are self sufficient for 4 weeks, dragging 50kg sledges on foot or by ski, containing tents, food, communication devices, cooking equipment and medical supplies. Checkpoints re-supply competitors at three stages along the route, but they remain independent across the race; choosing their route and race strategy.